Sir Alex Ferguson knew major work was needed to rebuild his Manchester United team - and he has responded in style with his dealings in the transfer market so far. Ashley Young's arrival from Aston Villa comes swiftly after the signing of Phil Jones from Blackburn Rovers, with Atletico Madrid goalkeeper David de Gea and a high-class midfield player also expected to make the move to Old Trafford. The loss to Barcelona in the Champions League final at Wembley did not exactly do United a favour but it would have confirmed in Ferguson's mind that his side was obviously on the wane. Some may have been fooled into thinking everything was OK given United's success in the Premier League but they were the best of a bad bunch last season and Ferguson is brutally realistic. I stand by my belief that he dragged those players to the title and would have claimed the crown with any of the other top sides had he been in charge of them. How United won the title playing as badly as they did away from home, where they were abysmal on so many occasions, was almost beyond belief. Ferguson will have been well aware that they might not have been so lucky next season. Ferguson had two factors to address. First, the team was awful for long spells last season and really suffered against Barcelona. 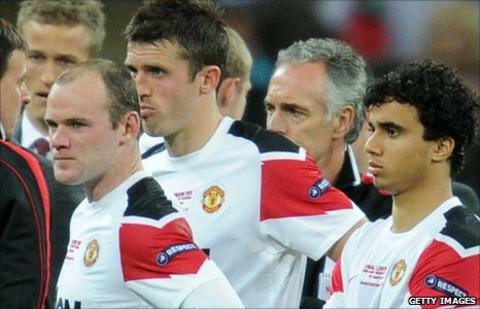 Secondly, the natural passage of time has resulted in the retirements of Edwin van der Sar, Gary Neville and Paul Scholes, while Ryan Giggs is edging ever nearer towards the end of his career. Giggs was magnificent last season but can you see him having another season like that at the age of 37? I can't. Ferguson has bought defender Jones, who is only a youngster and is clearly a signing for the future. Young, a winger, is a proven, fabulous player with great delivery who will add much. If you watched United last season, they were weak all over. The fact that they won the league was a work of art in itself, the sign of a great club and a great manager, with Ferguson as the key component. The loss of Scholes and the fact that Giggs is another year closer to the end of his career means Ferguson is almost certain to strengthen in midfield. He has been linked with Tottenham's Luka Modric and Wesley Sneijder from Inter Milan, both fabulous players. I do not know where Modric is going, or even if he is going because Spurs chairman Daniel Levy gave Chelsea very short shrift last week, but if I was Ferguson I would break the bank to land the Croatian. He fits the bill perfectly. Modric is a class act and his performance when Spurs won at Liverpool on the final day of last season was as good as it gets. When the ball comes to him, he doesn't just instinctively know his three options, he knows the best one to take. He also always has time and space in abundance - the hallmark of the great player. Ferguson will obviously recruit a goalkeeper to replace Van der Sar, who was a major reason for their success last season and has been for the last five years. De Gea appears to be the chosen one but the hardest person to replace in your team is always the goalkeeper, as proved by United's struggles to find a quality successor to Peter Schmeichel. Bringing a foreign keeper into the English game is always hit and miss because a big part of the game here is the ball into the box. We have seen the likes of Heurelho Gomes struggle to cope with that aspect of the game whereas Van der Sar was consummate and his communication skills were wonderful. De Gea is only a young boy, so it will be very intriguing to see how he goes if he does sign for United. Retirement and age have taken some of Ferguson's best players out of the equation but he is a master when faced with this sort of situation. He will also be aware of the challenges coming from elsewhere. United and Chelsea undoubtedly came back towards the pack last season, while Manchester City may feel they will never have a better chance of winning the Premier League than next time around. They will spend, Roman Abramovich will back new Chelsea boss Andre Villlas-Boas, while over at Anfield, where not much escapes Ferguson's attention, they now have the Kenny Dalglish factor. Liverpool will clearly strengthen their squad this summer and there is still the feel-good factor following Dalglish's arrival, which galvanised the whole club. Luis Suarez will also be ready for his first full season in the Premier League. The striker was sensational after coming to Anfield in January. But history tells us there is nobody better at coming out on top in a pressurised position than Ferguson. He clearly means business after taking stock of the current condition of his squad. And you would never back against him - you can't back against him - because if he can take his team to the title playing the way they did last season then they would have to start as favourites next season as he begins the process of building his latest Old Trafford model.